Here’s a performance of Down By The Sally Gardens from the event, I hear it in the Deep Hearts Core, live in Pearse Street Library on Poetry Day last week. Cathal Quinn and I had a lovely audience thanks to Dublin City Libraries and Guthanna Binne Síoraí. The Irish in the song and the show was translated by the one and only Gabriel Rosenstock. Notes: Poetry Day Ireland 2018 Pearse Street Library – “I Hear It in the Deep Heart’s Core” with Guthanna Binne Síoraí. Celebrating the poetry of WB Yeats in word and song. 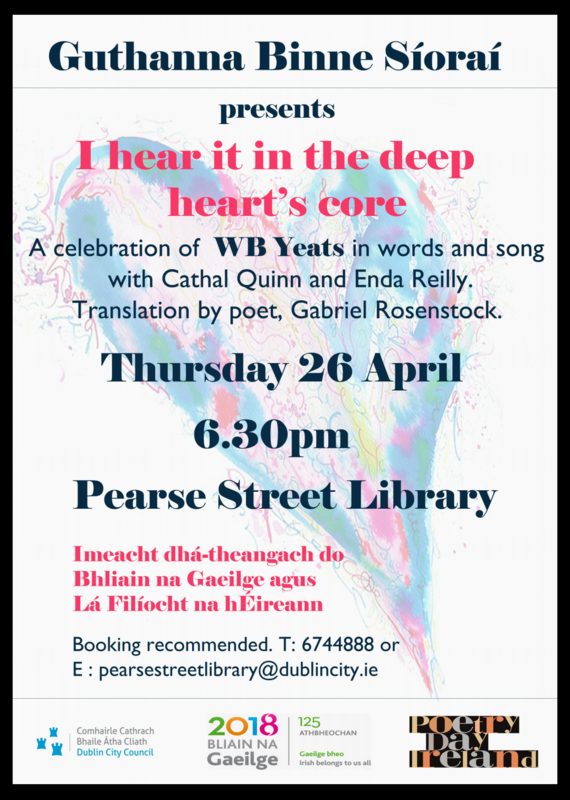 Artistic Director Cathal Quinn and musician, composer and singer Enda Reilly take you on a journey through the poetry of Yeats, spoken and sung in English and Irish, with translations by Gabriel Rosenstock. Enda sets many of the well-known Yeats poems to music, adding a rich addition to these magnificent works, with some pithy and witty explanations in between the poems. Booking recommended. Notes: An Túr/the Tower: the Tarot Project Imram Féile Litríochta Gaeilge I’m performing three of Bob Dylan’s epic songs in irish! Isis, No Time To Think and Changing of the Guards, all of which are translated to irish by Gabriel Rosenstock. Delighted to be sharing the stage again with the awesome Dairena Ní Chinéide and the wonderful Helen Ivory to explore the weird world of Tarot. More info about the performance below. The art of Tarot poetics began in Renaissance Italy with Teo lo Folengo and his contemporaries, and since then poets including W B Yeats, T S Eliot and Marge Piercy have used the Tarot in their work. Curated by Liam Carson, The Tower features Dairena Ní Chinnéide (in Irish) and Helen Ivory (in English)reading work inspired by the Tarot cards, with on-screen projections created by Margaret Lonergan. On his albums Desire and Street-Legal, Bob Dylan wrote a series of songs drenched in Tarot imagery, and a selection of these, transcreated into Irish by Gabriel Rosenstock, will be performed by Enda Reilly. IN ASSOCIATION WITH INTERNATIONAL LITERATURE FESTIVAL, DUBLIN Ba san Iodáil a cuireadh tús le healaín éigse an Tarot agus ó aimsir Teo lo Folengo agus na lí a bhí comhaimseartha leis tá leas á bhaint ag lí as an Tarot, ina measc W B Yeats, T S Eliot agus Marge Piercy. Is é Liam Carson coiméadai An Túr/The Tower, seó a léireoidh dánta le Dairena Ní Chinnéide agus Helen Ivory a tháinig faoi thionchar na gcártaí Tarot. Teilgfidh Margaret Lonergan físeanna draíochtacha ar an scáileán. Chum Bob Dylan roinnt amhrán sna halbaim Desire agus Street-Legal atá ar maos in íomhánna Tarot agus canfaidh Enda Reilly cuid acu sin, traschruthaithe ag Gabriel Rosenstock.